This app is design to Notify you with brightflash alert as Call and sms notifier, Flash alert on call will make your life easier by letting you know about every call and SMS through flash blinks. Use flash notification alerts when you're in a meeting or if your baby is asleep. You never know when silent blinking flashes could come in handy with this flash notifications. Flash alert on call is a smart and Amazing application available on the Google Play Store it's Pretty useful when you are in a dark place or in a meeting where you don't want to hear ringtones or vibration. Imagine you are in a heavy music party or at night where you cannot hear ring tones and cannot feel vibration. So this Flash on call and Flash on SMS will notify you clearly. Flash alerts puts the power of blinking flash customization for your android phone at your fingertips. Create unique flashlight alerts blink patterns for incoming phone calls, texts ( SMS ). For example use flashlight alerts on call and sms for all call and sms notifications, This Flash Notification will notify you via mobile phone’s back light flash alerts. 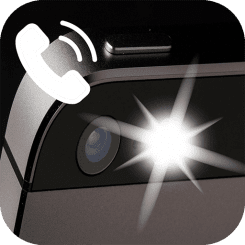 Flash alert on call is a smart app to alert you when you receive a phone call, text message & any other social notifications with the blink of your flashlight. you can quickly enable and disable Flash Alert on Call and Sms or both. • You're in a noisy location and can't hear your ringtone, no problem, you have flash alerts on call and sms.